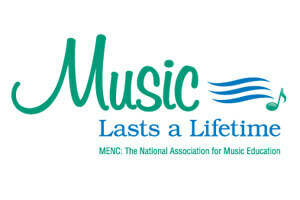 March has been officially designated by MENC: The National Association for Music Education for the observance of Music In Our Schools Month (MIOSM), the time of year when music education becomes the focus of schools across the nation. MIOSM began as a single statewide celebration in 1973, and has grown over the decades to encompass a day, then a week, and then in 1985 to become a month-long recognition of music in our schools. The purpose of MIOSM is to raise awareness of the importance of music education for all children – and to remind citizens that school is where all children should have access to music. MIOSM is an opportunity for music teachers to bring their music programs to the attention of the school and the community and to display the benefits school music brings to students of all ages. The celebration continues to grow each year, reaching more and more students, teachers, musicians, and music supporters. Schools and communities throughout the country and overseas celebrate MIOSM with concerts and other activities based on the year's theme. For the thousands of young men and women comprising the ranks of Drum Corps International's elite units, the quest to achieve the ultimate performances you see on the drum corps stage each summer began with a first step in a music classroom. Drum Corps International invites you to join us in showing our appreciation for the band directors, music teachers and color guard instructors who are responsible for the education and development of these outstanding young performers.